Most of us turn on the faucet and don’t pay much attention to how the hot water arrives — until, of course, it doesn’t. We take the mighty hot water heater in our homes for granted. But ignoring your hot water heater might mean passing up an opportunity to gain some hot water heater energy savings. Water heater energy usage makes up about 18 percent of the average utility bill, after all. You can find hot water heater energy savings a few different ways — taking shorter showers, for instance. But knowing how to choose a hot water heater that is energy efficient from the beginning is the best way to lower your energy costs from the first time that heater kicks on. Other than actual equipment cost, you might not have thought too much about selecting a water heater. But, to get hot water heater energy savings, there are some factors to consider before you purchase. For example, calculating the best size water heater to fit your space and average usage, and conducting a water heater energy usage comparison between heater styles can make a big difference. Not to worry, though. 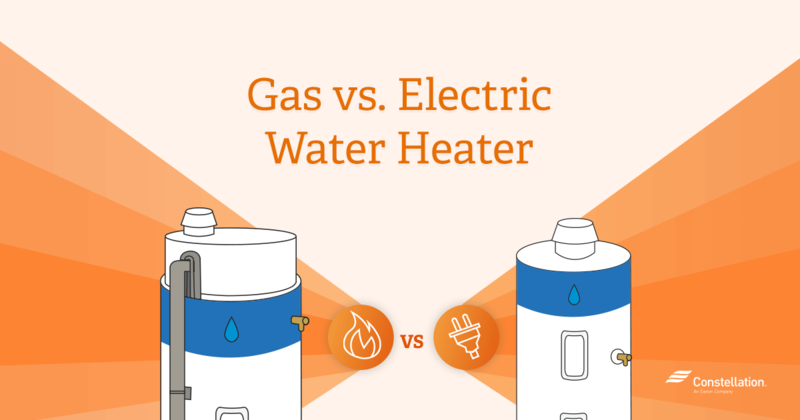 We’ll explore the different types of hot water heaters — here, we’ll compare gas vs. electric water heaters; but check our other piece, which will examine tankless vs. traditional water heaters. First, some basics for selecting a water heater. A single-family tank water heater has a reservoir of hot water ranging from 20 to 80 gallons. When someone turns on the hot water faucet, the hot water is released from the top of the tank and piped to where it’s needed in the house. The hot water in the tank is replaced with cold water entering the bottom of the tank to ensure the tank is always full. Determine how much water your household needs. A family of four, for instance, might take several showers, run the dishwasher and wash a few loads of laundry — all in one day. While this might total 100 gallons of water use, that doesn’t mean the water heater needs a 100-gallon capacity. Be as accurate as possible with this estimate. After all, is there anything worse than taking a shower and running out of hot water? Well, that can happen if sizing a hot water heater has been done incorrectly for your household. Consumer Reports advises that when sizing a hot water heater, you keep in mind the first-hour rating (FHR) for a tank water heater when doing a water heater energy usage comparison. This information indicates how much hot water can be delivered in the first hour. Then, depending on the specific model, you can look at the time the heater requires to return to its full FHR. Energy.gov offers a formula to help with sizing a water heater for your needs. Pay attention to comparisons between energy efficient water heaters. Consumer Reports says that new federal efficiency standards mean that today’s water heaters have improved hot water heater energy savings, overall. Heaters with fewer than 55 gallons should see about a four percent efficiency boost, thanks to the standards, the consumer organization says; water heaters larger than 55 gallons, meanwhile, might cut a utility bill by 25-50 percent, depending on the technology of the heater. When doing a water heater energy usage comparison, Energy.gov recommends using the ubiquitous yellow Energy Guide label found on appliances to identify energy efficient water heaters. The FHR rating is in the top left corner on water heater labels and is noted as “capacity (first hour rating).” When doing a water heater energy usage comparison, Energy.gov recommends looking for models with FHRs that match within one or two gallons of your peak hour demand. The daily peak hour demand is the one-hour hot water need for your household. Do you currently have an energy efficient water heater? That depends on its age. The older your hot water heater, the more likely you’re losing hot water energy heater savings. Consumer Reports suggests that if your water heater has a 12-year warranty and you’ve been using it for 15, it’s likely time to look for one of the more energy-efficient options to maximize hot water heater energy savings. The Department of Energy has changed the regulations on hot water heaters that make today’s models more likely to offer savings. Another consideration when selecting a water heater is the type of energy it uses. While solar and tankless versions are increasingly energy efficient, water heaters that use natural gas or electricity are still the most common. 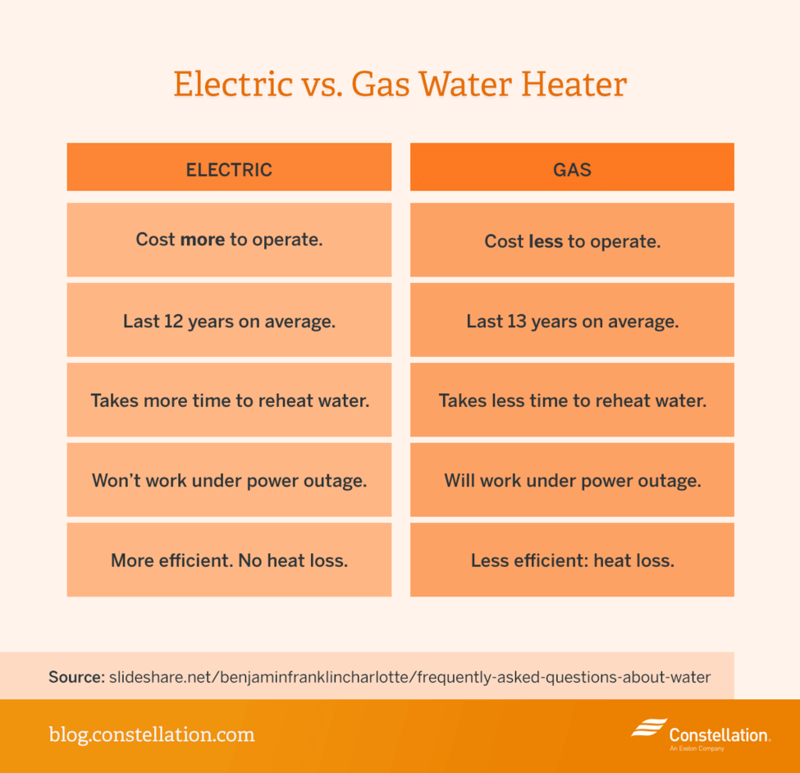 Let’s take a look at gas vs. electric water heaters because they are so common. For the most part, the choice boils down to understanding gas vs. electric water heater operating costs. Michael Bluejay, aka “Mr. Electricity,” has spent his career analyzing energy use, including hot water heater energy savings and the differences between gas vs. electric water heaters. In a gas vs. electric water heater operating cost analysis, he says, gas is almost always cheaper than electric. Bluejay says gas water heaters typically cost about $30 a month to run, while electric water heaters run closer to $42 a month, depending on utility rates, of course. This analysis of gas vs. electric water heater operating costs is based partially on the fact that natural gas is typically less expensive than electricity, and assumes that you already have access to natural gas in your home. Having to put in a natural gas line would add expense and mean that it would take much longer to realize any potential hot water heater energy savings. Electric heaters are less expensive to purchase. Electric heaters are easier to install. Electric heaters are generally safer since they don’t have any fuel that could leak or explode and have no combustible byproducts. Electric tank heaters operate more efficiently than gas heaters because gas heaters lose heat through venting. Now you should know how to choose a hot water heater if replacing your current model with a modern, more energy efficient water heater makes sense. Bottom line, if your utility bill is higher than you’d like, it’s worth taking a look at your hot water heater to see if it needs to be replaced. When it comes to lowering your energy bill, every little bit can help. Hi Elijah, we’re happy to help! Wrong. Within the same brand and same capacity, there are the same, give or take a few dollars. Hi John, through our research, we’ve found that water heaters with the same water capacity differ in price from electricity to natural gas. We appreciate your feedback! Hi Albert, that’s great to hear! Thanks for visiting. Thanks , It was very good and comprehensive. Thanks, this is helpful. But, what about noise as a factor? Just moved into a house with older gas powervent that I’m seeking to replace. It is vented outside my bedroom window, and practically SCREAMS when it is running (and no, doesn’t work during a power outage). I feel sorry for my neighbors. I am seriously considering replacing it with an electric unit because of the noise factor. Hi Jill, That’s a great element to factor in. We intended to primarily focus on the energy side of gas vs electric water heaters — but if the noise of your current gas water heater is affecting your quality of life, choosing an electric water heater might be best for you! Why would you EVER need to heat HOT WATER? LOL! Ha ha! Fair point, Phil. We’re happy to help! Thank you. What about for a household like mine that has solar panels?! Solar panels only produce electricity, so if you do not have a natural gas hookup, electric water heaters will most likely be your best bet. The part about gas heaters working without electricity is no longer valid with the newer power vented gas heaters. that’s a great point! This fact may differ between energy users, since many households still use an older gas heater that does not have power-vented gas heaters. That side to side comparison of gas vs electric is really missing the CO2 emissions, given that you can power the electric one without adding to the green house effect. We should start taking that more in consideration, in my humble opinion, because it should not be about finding the cheapest way to do something, but about finding the more efficient way and then making that cheaper. Chuy, thank you for your input, we’ve taken it to heart! We will be sure to factor in CO2 emissions when researching our future appliance posts.